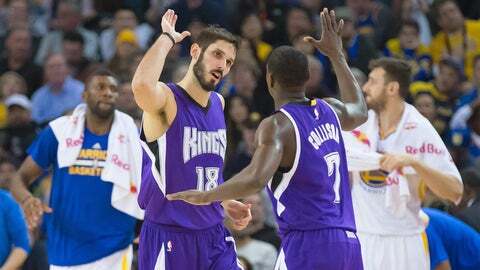 Sacramento Kings forward Omri Casspi (left) had quite the night against Steph Curry and the Warriors. Something amazing happened Monday night involving Steph Curry, which I realize sounds strikingly similar to any other routine weeknight when the Golden State Warriors are playing, except this one was different. Curry engaged in a shootout and "lost" (quotes because there was no true "loser" in this duel and the Warriors beat the Sacramento Kings, 122-103). Here’s what happened: Curry was held scoreless for the first 21 minutes of the game before erupting for 17 points in the final three minutes of the second quarter. But while he turned up the heat, so did Sacramento’s Omri Casspi, who went head-to-head in a shootout with Curry and wouldn’t back down at all. Casspi, who went 7-for-7 on 3s in the first half, was busy draining shots like this. With a little over three minutes left in the second quarter, Curry got going with this slick shot. Then Casspi and Curry started trading daggers. Casspi knocked down this triple. Before Curry responded with this. So then Casspi said, "What’s up, Steph?" And Curry responded, "Not much — just being the best in the world at doing this." Of course, Casspi couldn’t take that, so he showed off a little head fake before draining another 3. At that point, Curry just started messing with fools. It was an incredible battle. Curry finished the night with a triple-double — 23 points, 14 rebounds, 10 assists (6-of-13 from 3) — but Casspi won the head-to-head shootout with 36 points (9-of-12 from 3) to go with his six rebounds and one assist. It’s not often someone outshoots Steph Curry. Teddy Mitrosilis works in social content development at FOX Sports Digital. Follow him on Twitter @TMitrosilis and email him at tmitrosilis@gmail.com.